Some of the cats are sacked out in the sunshine and others inside the Blue Ox Millworks office by crackling wood stoves. Bluto, the golden-eyed, bear-faced dog, flops like a giant, piled-up rug on some unevenly stacked timbers in the yard. Birds are talking, the air is still, it’s an early spring in early February. Peaceful. But the people are busy. 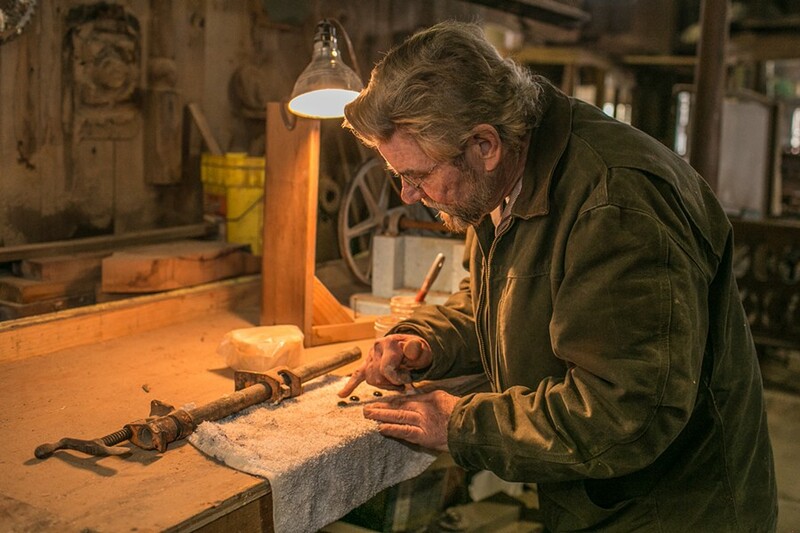 Someone’s hammering on metal in the blacksmith shop, tink-tink-tink-tink. A blue beast of a tractor, three-quarters of a century old, rumbles to life. 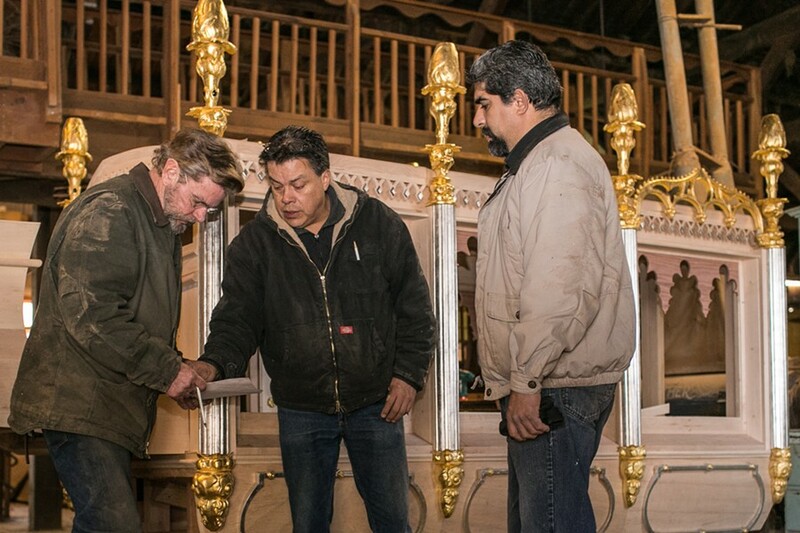 And inside the cavernous workshop behind the office, Blue Ox master craftsman Eric Hollenbeck and his two main woodworkers stand beside an ornate, partly finished hearse working out a last-minute detail. 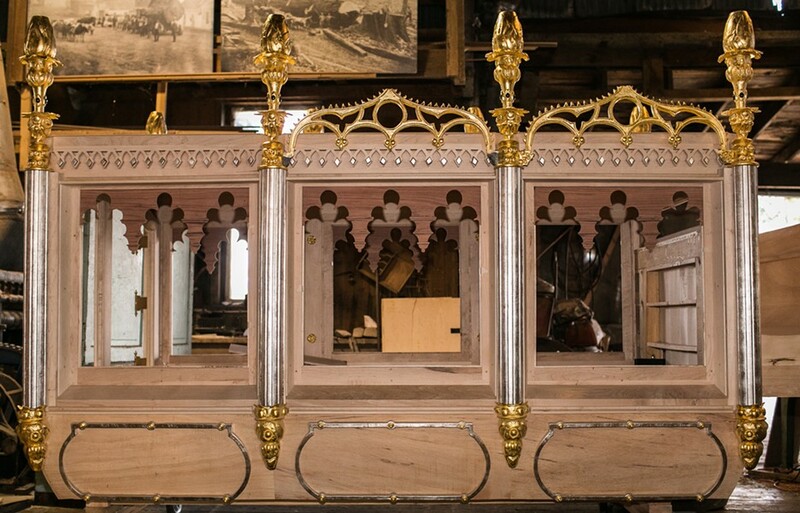 The hearse is a replica of the original that carried President Abraham Lincoln’s body on the final leg of the funeral procession’s two-week, 1,654-mile train journey back in April and May of 1865. The original hearse is gone; this one is, as Hollenbeck puts it, as authentic as humanly possible. And war veterans, mostly, have been building it. In a few days, the hearse will be on its way, accompanied by Hollenbeck (a Vietnam veteran), to Tombstone, Arizona. There, after Hollenbeck takes the hearse apart,Tombstone Hearse and Trike Co.’s Jack Feather, a Vietnam veteran and the lead builder in this project, will paint its body pieces black. After it’s reassembled Feather will finish the interior and assemble the chassis, wheels and axles built by Jay Jones (also a Vietnam veteran) of Custom Wagons in Kentucky. 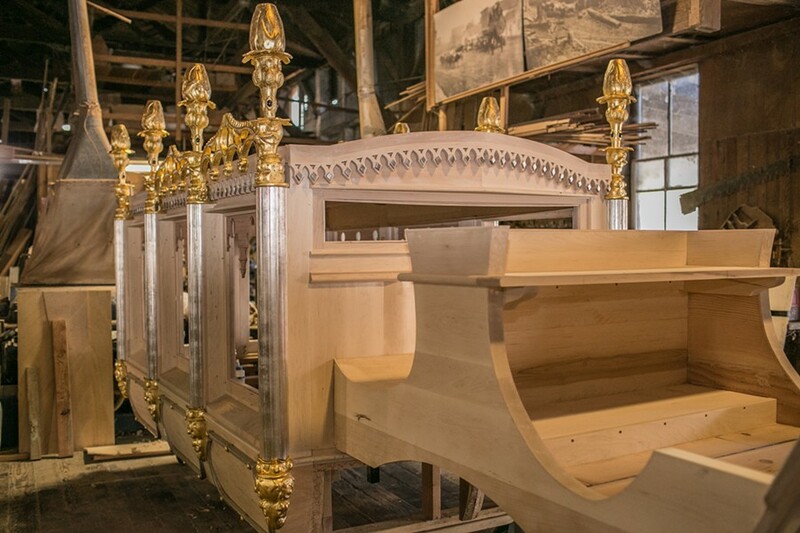 And then the hearse will go to Springfield, Illinois, where on May 1 through 3 it will star in the 150th anniversary commemoration of Lincoln’s funeral. 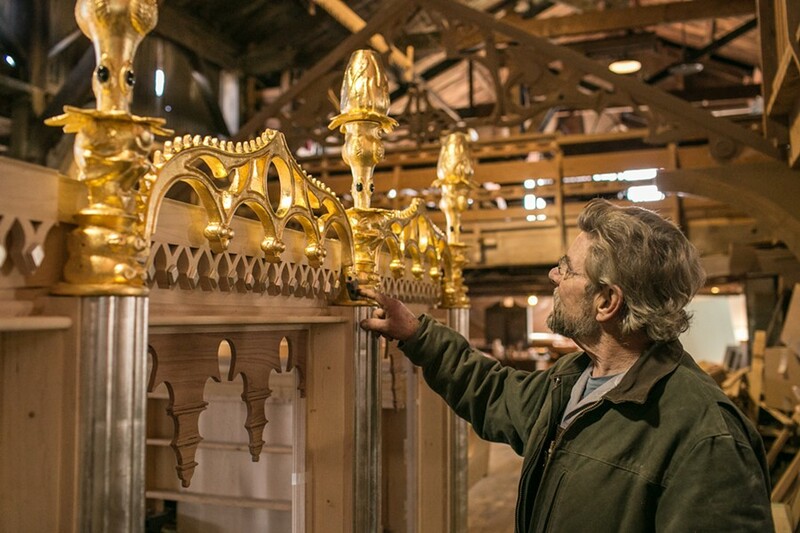 Then it will be stationed with the Staab Family Livery Co., which has overseen the work. But before the hearse leaves Eureka, the public can see it up close at free open houses this Saturday, Feb. 14, from 10 a.m. to 4 p.m., and Monday, Feb. 16, from 10 a.m. to 3 p.m. at Blue Ox Historic Park, First and X streets in Eureka. 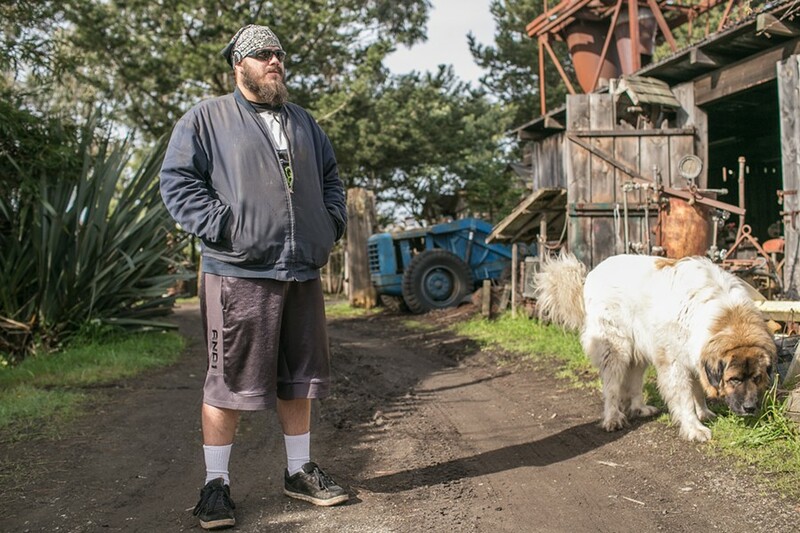 For the dozen or so combat veterans who’ve labored on the hearse the past nine months at Blue Ox alongside Hollenbeck, his wife, Viviana, and other craftspeople, it’s the end of an intensely challenging project. But it’s just the beginning of the new veterans program at Blue Ox th at, in collaboration with College of the Redwoods, is intended to help veterans — through learning new skills at this quiet, other-time, industrious park — seek a sense of purpose and peace that’s often eluded them in post-war civilian life. The hearse that carried Lincoln on the last day of his funeral procession in 1865. Numerous hearses carried Lincoln’s body in the cities visited by the funeral procession. The photo, above, is the only known existing photo of Lincoln’s final hearse, which, drawn by six black horses, carried him to Oak Ridge Cemetery. 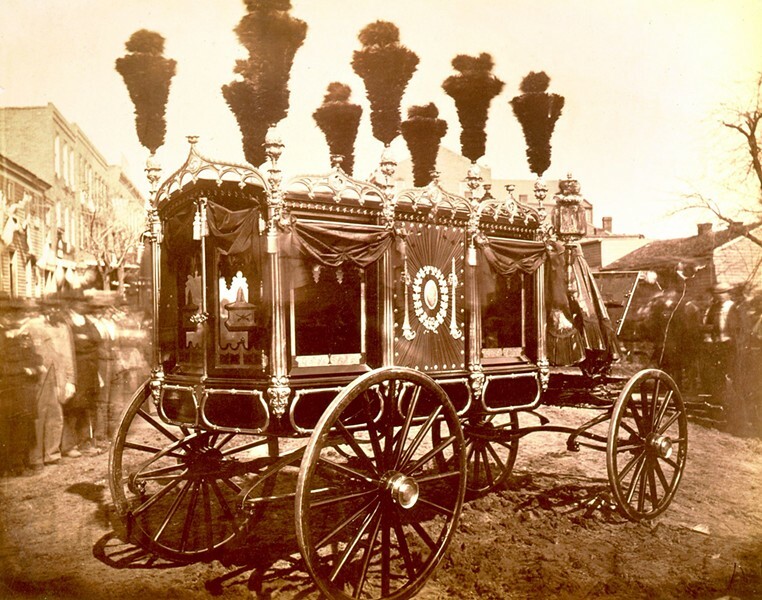 The hearse was built in Philadelphia in 1857 for St. Louis livery operators Lynch & Arnot. It cost $6,000 then — nearly $200,000 in today’s dollars. Before Lincoln, it had carried the bodies of Gen. Nathaniel Lyon, the first general to die in the Civil War; and both a Missouri governor and senator. For Lincoln, a new wood and cloth panel was built for the middle window, with 36 stars for each state of the Union, upside-down torches and a silver medallion with the president’s initials, “in memoriam” and “May 1, 1865” engraved on it. The hearse was lost in a livery stable fire in 1887 that also killed three men and about 200 horses. The new hearse, under construction at Blue Ox Millworks. Hollenbeck and his crew, conferring daily with historians elsewhere by conference call, recreated the hearse’s main body and decorative features using a single historic photo, an historic newspaper account of the procession, and the dimension of the back wheels from the old bill of lading from when the hearse was transported by train to Illinois. The photo was shot at an angle, so Hollenbeck had to correct for that before he could figure out the scale of the rest of the parts. 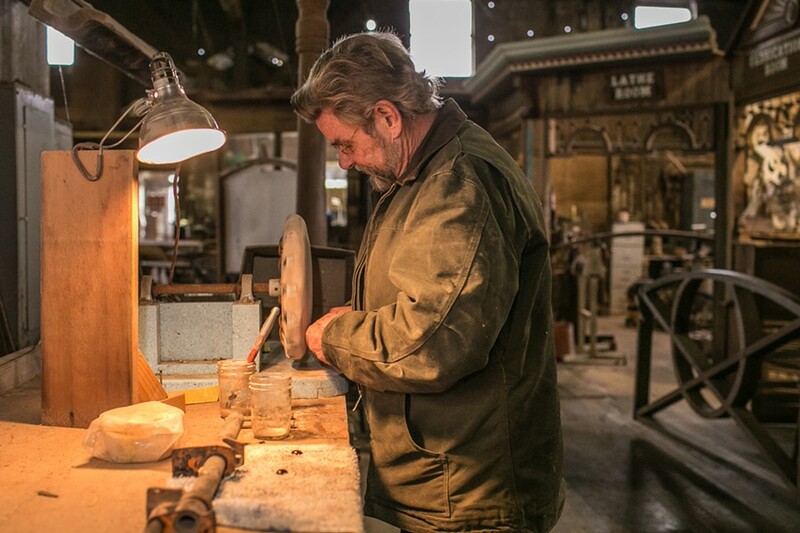 They designed and built everything — the main frame, in maple like the original except for the wooden frames that hold the glass panels in place, which are sturdier redwood; and the decorative details, carved in wood then cast in aluminum — melted-down scrap they collected at a junk yard. Charles Ellsworth and Lynnie Horrigan of Allpoints Signs then gold- and silver-leafed these details. Embedded in the fires-of-life pillars, which will be topped with ostrich feathers, are black cabochons made at Blue Ox from slabs of Brazilian onyx. Eric Hollenbeck and the hearse he and his crew built for the 150th commemoration of President Lincoln's funeral. The new Lincoln hearse, nearly finished, at Blue Ox. Eric Hollenbeck polishing a black onyx cabochon. Eric Hollenbeck polishing black onyx cabochons. Onyx, he says, was the Victorian symbol of mourning. Cody Drury, an Army veteran, with Bluto. Drury served from 2002 to 2004 in the mortar infantry. He helped build the Lincoln hearse and became skilled at Blue Ox in numerous trades. He says Blue Ox is his sanctuary.